There has been a theme in my life for the last month or so. It has been coming at me from every single direction in my life. In some work situations, here on the blog, in my yoga practice. Everyone is telling me to get out of what feels comfortable in order to make great things happen for me. Since this is my blog, I’ll use my life as an example (don’t I always?). I have been in the same position at my job for the last 2 years or so, with not a whole lot of change (including my salary). Also, this little blog thing I have going on here. I feel that it has been in the same spot for the last six months or so, with not a huge amount of growth. Yoga – the other day in my practice, I was feeling very comfortable in my positions and poses. My instructor told us as one point that if we wanted to flip our downdog upside down, to try it out. I had no intention to try because I was feeling very comfortable where I was in my normal upright downdog. But then I tried it. It was hard, but I did it. I didn’t fall like I was scared I would do. I was able to stretch in a way I hadn’t been able to in the past (I’m kind of sore from it now though! ), and now my yoga practice has been kicked up a notch. I now feel as though I can take a few more risks and that my comfort zone has been expanded. I will now always be comfortable to flip my dog upside down and will have another goal to reach for that’s outside of my comfort zone. Let me paint a little picture for you. 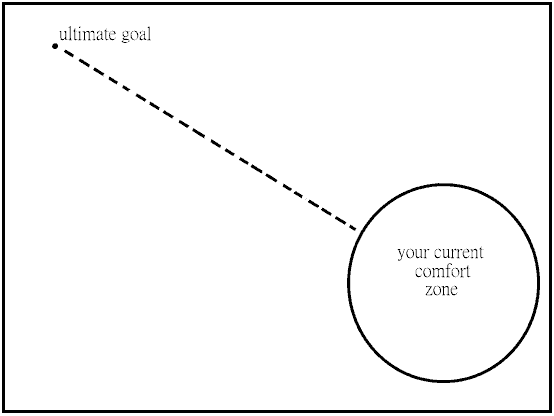 This is how my brother helped me to visualize how we are able to grow by stepping out of our comfort zones in order to reach our ultimate goals. 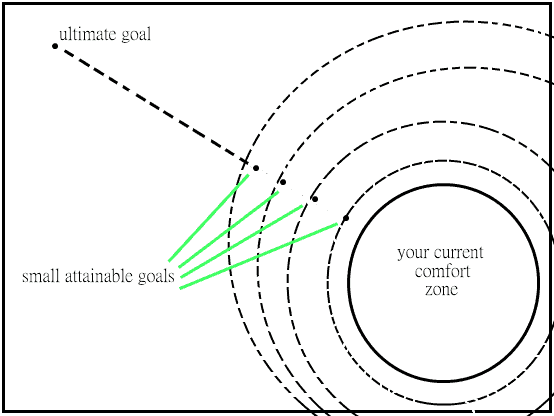 Looking at this diagram, your ultimate goal seems so far away in relation to the comfort zone you are currently living in. Once you start making and reaching your small attainable goals, your comfort zone starts to become larger and larger. You are then able to achieve more in your daily life. What would happen if I used this same experience that I had on my yoga mat in other aspects of my life? What if I went outside my comfort zone at work and started taking on projects that I’ve never done before? You take them on, and you work them like a rockstar. And before you know it, you have achieved something outside of your comfort zone and you can add that type of project to something that is now naturally in your comfort zone. I was also able to apply this platform to my eating disorder recovery. For me to say that I wanted to achieve the ultimate goal of recovery was so huge and overwhelming. So instead, I started with a small goal that was easily attainable. I set myself a place at the dinner table. That was something I could do. I did that until it was comfortable. Then I added something else like going to the gym and getting a healthy dose of exercise. I kept going until that felt comfortable. I started doing these two things so often that it just become part of my normal life, and I was that much closer to my ultimate goal of recovery from disordered eating. I never went out and said, “I am going to resolve to recover from my eating disorder.” But I knew what steps I needed to take in order to get there. A little bit of therapy, a little bit of adding meals to my day, a little bit of gym time, and a few other things. Not one bit of it was comfortable. I had to get out of my comfort zone in order to make amazing things happen. I was eventually able to reach my ultimate goal. There are still time I have to step outside my comfort zone in order to maintain my goals, but it’s not nearly as difficult as it used to be. 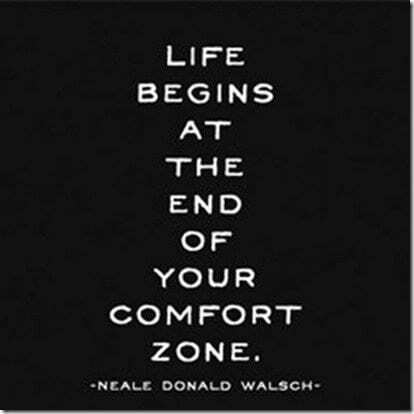 What is one way you feel you could step outside your comfort zone?